Canadian SF author Peter Watts, best-known for the much-nominated Blindsight, has written a Crysis tie-in novel. 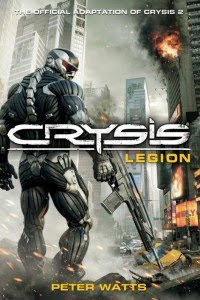 The book, Crysis: Legion, sets up and adapts the plot of the forthcoming game Crysis 2. The move makes sense, as Watts has been consulted on the plot and storyline of Crysis 2, as has fellow SF author Richard Morgan. The book is due out in March 2011, with the game to follow after. Actually, I had nothing to do with the original Crysis. I still haven't even played the thing. Amended and apologies. That was my faulty memory at work. But you have worked on Crysis 2 as writer, is that correct? I did a bit of consulting, wrote the nanosuit brochure that went online a few months back. But it was Richard who wrote the game script. Blindsight is an amazing, amazing novel. Read it online, but I'm buying it, Watts. You keep kicking tush. Have you read Blindsight? If so, what did you think? Still dig Peter Watts' icon. I know it's supposed to be a squid head, but it looks like a grouchy Christmas tree to me, and its expression gives me giggles. Anyone know where it came from, what the whole cartoon looks like? i have no interest in a Crysis video game, but I'll buy anything with Peter Watt's name on it. i like that you are a Canadian author. that's pretty sweet.